The Nedor-A-Day blog brings us Lincoln Ellsworth: Hero of the Poles! from It Really Happened #11. I link to it not because it is a particularly great comic, but because it causes me to go on a tangent imagining an alternate reality where instead of cowboy genre comics in the forties and fifties, the newsstands were filled with arctic explorer genre comics. Such is the sort of random and frivolous qualifier that will sometimes make a comic a featured item on this blog. Let the reader beware. Click the below image to read the comic. A new Jack Chick comic is always a cause for celebration… or damnation! Mr. Chick continues his quest to save our souls with the healing powers of hatred, fear, paranoia and intolerance. This is a particularly bizarre one featuring vampires, just in time for Halloween. And as much as I like the work of Mr. Chick’s assistant (whose name I can’t recall right now), I MUCH prefer Chick’s own cartoony style, featured in this tract. Note that Mr. Chick’s All Tract Assortment has been the best bang for your buck in mini-comics for many, many years. 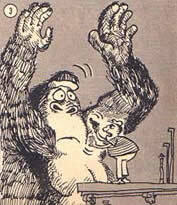 Finally, Gorilla Men brings us a collection of hilarious Don Martin and Sergio Aragones King Kong comics from Mad Magazine. The Art Stars of the Month! from Comics Should Be Good! 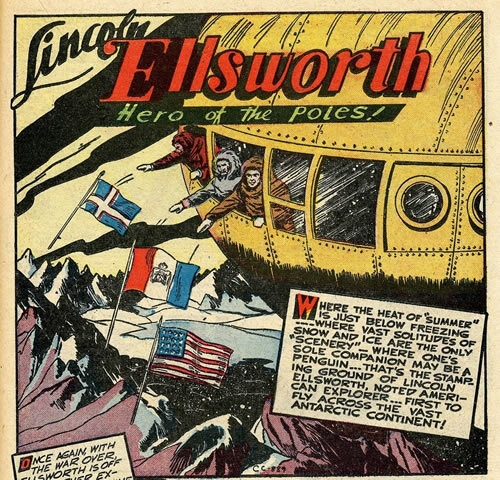 Lincoln Ellsworth: Hero of The Poles!